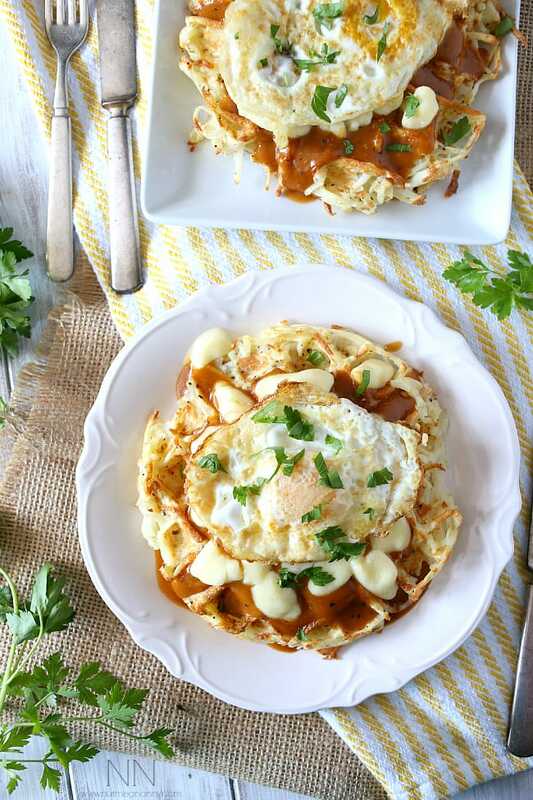 These crispy poutine hash brown waffles are the perfect way to start the day. 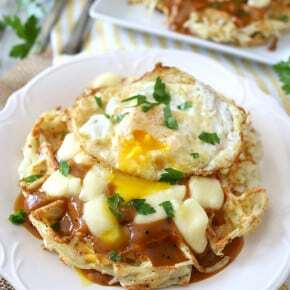 Crispy potato waffles, homemade gravy, cheese curds and a fried egg. Hello breakfast! Years ago my husband and I went on a cruise to Canada. Lets just say we were the only people on that cruise that was under the age of 60. Apparently young folks don’t like going north? I don’t know, I wanted to go just to see the pretty leaves. I’m such a sucker for fall foliage. One day on the trip we were walking through a little market and saw they were selling poutine. I was totally intrigued because I had heard of poutine before but had never had it. I had experience disco fries which is what I consider to be the closest east coast relative to poutine. Disco fries are hot fries covered in gravy and melted cheese. Poutine is hot fries covered in gravy and cheese curds. See? Totally similar…but weirdly different at the same time. Personally I think poutine is better. I think it’s the curds. This recipe is a throw back to my time eating massive amount of poutine except I gave it a breakfast twist. I used some Simply Potatoes hash browns and threw them in the waffle iron. They turned out crispy, golden and perfect for breakfast. I then topped it with a little homemade gravy and some totally authentic cheddar cheese curds. 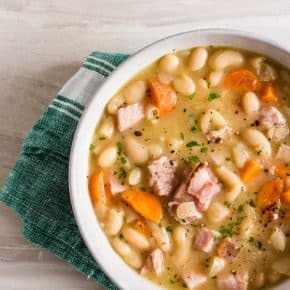 Sooooooo incredibly perfect for breakfast or breakfast for dinner. Which is basically my favorite thing ever. I kept the potato mixture pretty basic but you could easily sneak in some peppers, onions or any other vegetables you happen to be craving. 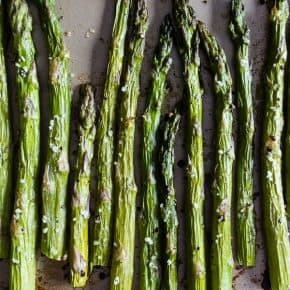 I like to think of it as a great way to sneak in some veggies to the kids who might not be super thrilled about eating them plain. Add to waffles iron and cook until crispy and brown. This will take longer than normal waffles. I popped mine open a few times to see their doneness. While you are cooking your hash brown waffles start to prepare the gravy. In a skillet set over medium high heat add stock, butter, pepper, garlic and onion powder. Bring to a boil. Mix cold water and cornstarch together to create a runny mixture. Slowly pour mixture into the gravy and stir continuously. Let the mixture boil for a few minutes (keep stirring!) until thick. Remove from heat and let sit for a few minutes to thicken some more. Once the waffles are cooked top with hot gravy, cheese curds (the heat from the gravy should melt them) and top with a fried egg. Looking for some Simply Potatoes Favorites or maby some super yummy pins? Follow Simply Potatoes on Pinterest. Simply potatoes makes even more than just hashbrowns! See what was availble at my local store! Are you freakin’ kidding me? This one rocked my world! Okay, I’m so in love with this idea of potato waffles. On FB, I thought they were sort-of “normal” waffles with potatoes in them, but this is even better! And poutiiiiiiiiine! It’s gotta be the cheese curds. This sounds amazing. Oh girl, as a Montreal resident, poutine is my jam! I have never had it like this before and think this is SO awesome! Totally Canadian approved…oh, and if you’re ever back in the area you always have a host! I have been waiting for this post since you teased it on IG. Because it’s poutine in breakfast form, which is probably the best way to get poutine ever. Also poutine is way greater than disco fries. 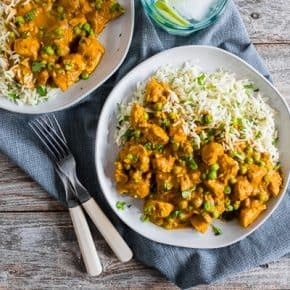 This is a super creative recipe! 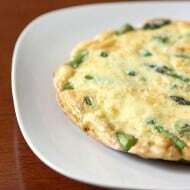 I could totally see it being served in a trendy restaurant for brunch here in Chicago. I am totally drooling for these waffles. Gravy, oh gravy is so much better than syrup. I love it! I’m pretty sure this is all I need in life. I’m such a gravy lover! 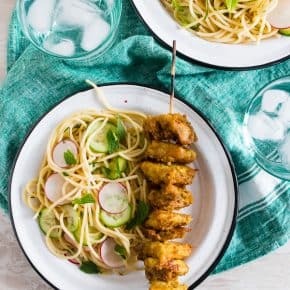 Another amazing recipe…and gorgeous photos too! Incredible! Sooo flippin’ creative! I love it! I’ve always wanted to try poutine! I, seriously, don’t know how you come up with these ideas but I’m so glad you do….and share them with everyone because….OMG! I want to stick my face it that! This is my kind of breakfast and we just adore Simply Potatoes! Seriously? Your waffle kick is amazing and I hope you don’t plan on stopping anytime soon! I LOVE poutine! I had my one and only poutine when I was in Quebec several years ago…best stuff ever! I am definitely making this amazing breakfast twist! This breakfast looks delicious and like something my family would love. I especially like how the waffle nooks catch every drop of the luscious egg yolk. MMMmmm. Pinned for later as well! Wow, just wow…this looks insanely good! First of all – can you PLEASE come make me breakfast???? And I totally want ot go on an Alaskan cruise – it’s on my bucket list! Is this real life? Because this breakfast is made of my dreams. You made me smarter today . I had never heard of poutine or disco fries. Looks great and I’ll go cruising with you too – anytime! This is what I want to wake up to! These are the best thing to have happened to the Internet today. Dear Lord I need this in mah belly. What a delicious way to make waffles! I always grab a bag of Simply Potatoes when I spot them at the market! I grew up in Canada and I’ve never eaten poutine! I ‘m afraid that once I try it, that I won’t want fries any other way! Love how the hash browns get more crispy edges from the waffle iron! We don’t have cheese curds where I live!!! I’m so wanting to try them!! Looks amazing! P.S. It was wonderful to meet you in person this weekend Brandy! This looks A-mazing! 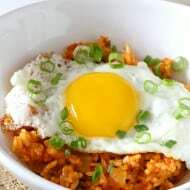 I love breakfast food for dinner and can totally go for it now! Oh wow. This has me droooooling! LOVE it! 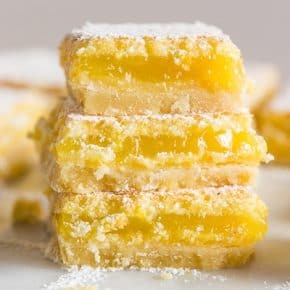 If I close my eyes and make a wish, will you make these appear on my table in the morning?? Man, they look good! 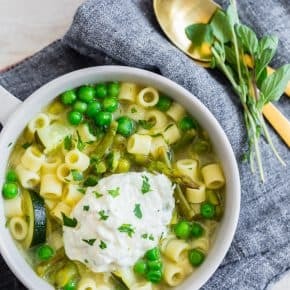 What a fun recipe. Truly DIFFERENT. I had never heard of Poutine to start with. But I love potatoes and eggs. I rarely let myself have gravy, but the word is rarely not never. Sounds decadent. Brilliant idea! I love how simple this is but it’s such a great change from the typical breakfast. I’m all over it! I adore poutine and think making it with hashbrowns in a waffle maker is Just.The.Best. Brava! WOW! I’m completely in love with these pictures and even more with the entire idea of this dish. Poutine is my all time favorite thing! Just EPIC. No words. Pinned! Oh my! This looks insanely DELICIOUS! What a terrific, no, genius idea! I have yet to try poutine (they have a poutine food truck here in Philly too – need to give it a try) but disco fries are a fave around these parts. 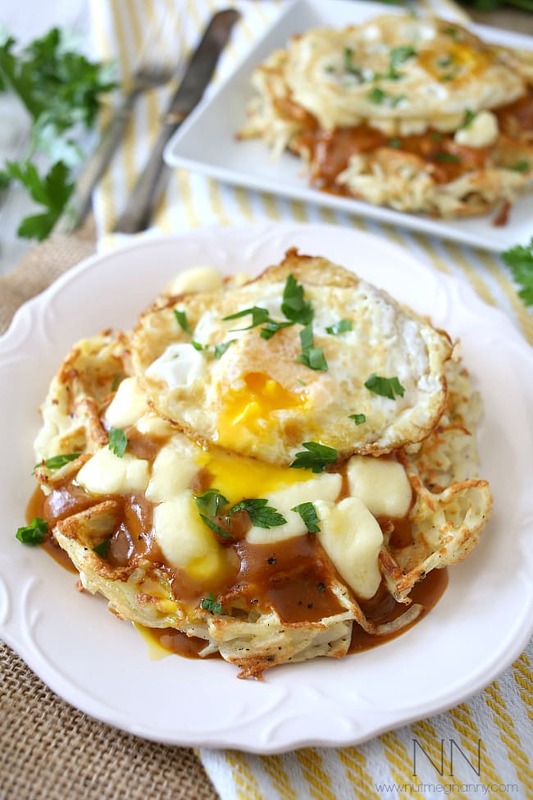 These poutine hash brown waffles look divine! OMG! You are brilliant! I bow at your brilliantness! Are you sure you’re not really a Canadian? Looking at these I think you just may be. Next time you visit the cold white North swing by for dinner. I’ve heard of poutine for years and have always wanted to try it. Why have I never thought to use cheese curds myself! living close to the border of Canada I think I’ve had my fair share of poutine….but this is sooo clever and unique. Love it! Are you freaking kidding me?!? ohhh these would be absolute perfection on a lazy Saturday morning!! My family would go nuts for this! So delicious! 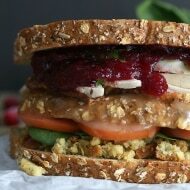 I need to get in the kitchen and make this right now! Hash brown waffles are the best! 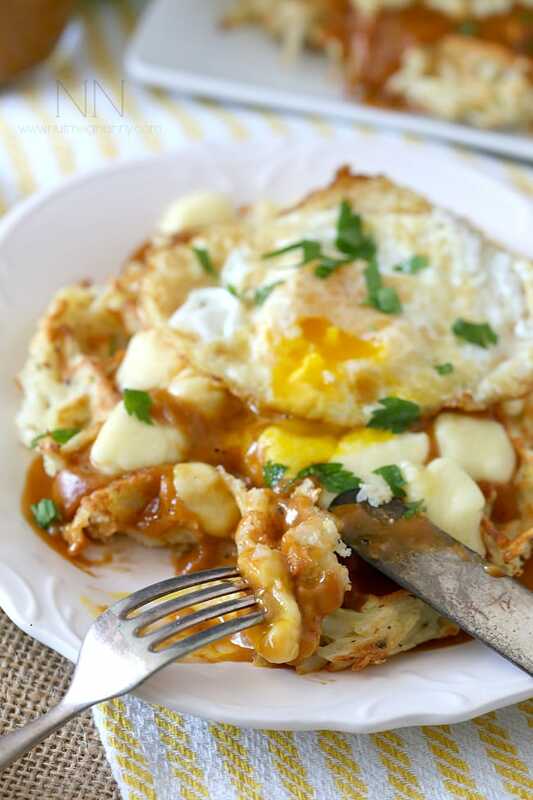 You totally took them to new heights with the poutine addition…and the fried egg/runny yolk! Seriously incredible.